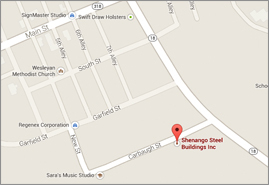 Shenango Steel Buildings, Inc. is a family-managed business with deep roots in Western Pennsylvania, located half way between Pittsburgh and Erie near the Ohio border. We’re located very close to the Ohio border with major Interstates 79 and 80 outside our doorstep. The Pittsburgh International Airport, Erie International Airport, Youngstown-Warren Regional Airport, Akron-Canton Airport and Cleveland Hopkins International Airport are all in driving distance of us. Stop by for a factory visit! Privacy Statement: This information is completely confidential, and will be used by Shenango Steel Buildings only. It will not be given, traded, or sold to ANY other entity. Please have representative/dealer contact me via: Phone Fax E-Mail U.S. Mail No preference.